It was mild overnight, above zero and as the sun rose, it looked like the overcast skies would clear. By breakfast, bits of blue showed through the clouds. However, the temperature dropped a few degrees, just below freezing and the wind picked up. 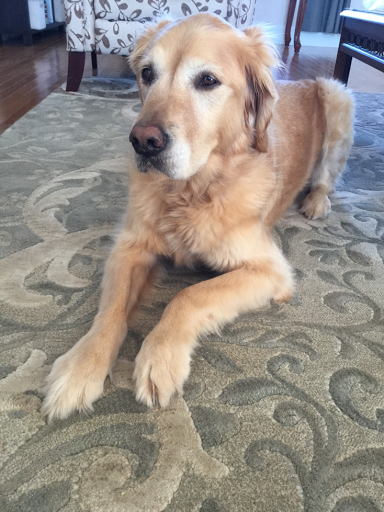 While we read the news after breakfast, the golden grand-dog was getting anxious for her walk. Georgie's idleness lets us know it's time to hit the road or trail for that daily adventure into the great outdoors, regardless of the weather. "Watch the black ice," my husband warned. "It was icy in spots early this morning." The local weatherman warned the same on his twitter account. I put on the footwear with the most traction but not the ice grips. I was not prepared for the flash freeze. As we headed out, it started to snow from a huge black cloud over the neighbourhood. Tiny snowballs fell all around and covered us. 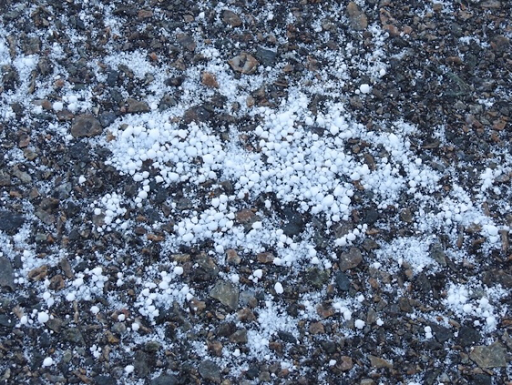 This type of snow is known as tapioca snow or graupel. With the wind as it was, drifts of snow crossed the road making the ice more difficult to see. The pavement was a tapioca covered skating rink. I gave Georgie some lead so if I fell I wouldn't land on her. That was all she needed. She pulled and when she did, off I slid, propelled by the wind at our backs and the brute strength of a golden retriever. Georgie had no trouble negotiating the ice as her claws dug in with every step. As I slid past the houses I was terrified. Frantic, I watched the road and the dog, hoping no cars would happen by as I was forced to go where my slide dog took me. In a panic by now, with images of the emergency room in my head, I looked for a way out of the dilemma and noticed the lawns looked safe. As Georgie swung by the curb, I jumped onto the grass. We walked there until we reached the house behind ours and crossed home through the backyard. Georgie, my heroine, slept most of the day. A well deserved rest! Scary! Smart idea to walk on the lawn! I haven't seen tapioca snow in years. Georgie is a beautiful dog. Hooray for Georgie and the lawn, so very glad you didn't fall. How long is Georgie staying? I will be dog-sitting grand-dog Tessa in a couple of weeks while het family take in some warmer weather, so I am keeping my fingers crossed that she won't pull me into a sliding on ice pickle like you experienced! Georgie is indeed a GRAND dog. We get black ice on our roads, but rarely anywhere else. Glad you stayed safe. It was a great ride in some ways, Andrea. I had to get out of danger, Debra. I thought the same as I wrote it, Jan. We must make quite a sight for the neighbours. We have tapioca snow occasionally, Joanne. Me too, Celia. Georgie is a great pet. Georgie goes home tomorrow, Shammickite. Just remember the lawns are usually safe place to walk if it's slippery. Good luck with Tessa. She is grand, EC. That black ice is treacherous. So glad you didn't have a fall as a result of the black ice, treacherous stuff. When our sidewalks are icy, I often walk our dog on people's lawns for stability. 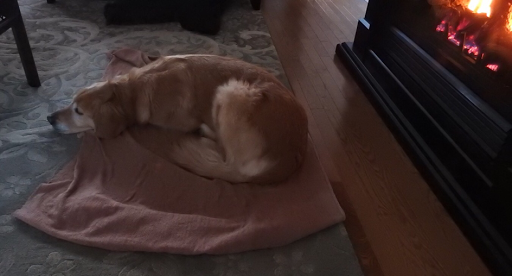 Always love the scene of a napping dog in front of the fireplace. What a great pup. A well-deserved rest indeed. The lawn is a great option for walking these days, Judith. I envisioned a different ending. Good quick thinking on your part. You know what they say about necessity, AC. That was a close call. I remember a long time ago when I had big dog and was walking her. We had stopped to smell a tree or whatever and I was looking elsewhere when she saw a cat and actually jerked me off my feet. I felt like Superman flying parallel to the ground. Luckily I did not hurt myself when I landed but it was the strangest feeling being pulled through the air by that dog. You were so fortunate, Barbara, as was I.
Glad you survived that little episode safely! I was lucky. Georgie looked after me, FG.